It seems like Terry Chapman gets to take all of the cool woodworking classes. From his week-long chair building class with Peter Galbert a few years ago to his latest visit to Roy Underhill’s Woodwright’s School to carve with Mary May – Terry is certainly learning from some of the best! This month in The Highland Woodturner we’ve included a classic article Terry wrote after attending a turning class with Mike Mahoney at Highland, several years back. Read about Terry’s experience learning from Mike Mahoney here. 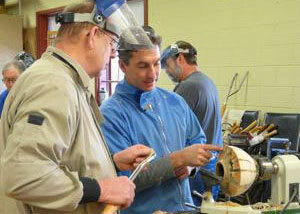 CLICK HERE to take a look at the full February issue of The Highland Woodturner.